Use the links below to access resources from Alyssa's presentation at NCCE 2019 in Seattle, WA. Use the links below to access resources for Alyssa's workshops at ISTE 2018 in Chicago, Il. Design Thinking + Keynote + Mindfulness = AWESOME! Use the links below to access materials for Alyssa's workshops at IntegratED 2018 in Portland, OR. "Easy Flipping with Clips + Screen Recording"
"Keynote Magic: It's Not Just for Presentations!" "#OneStoryForward: Building Connections One Story at a Time"
Use the links below to access materials for Alyssa's presentations at NCCE 2018 in Seattle, WA. "ClipThat! Watch a minute, save a minute, CREATE a minute!" "Dynamic Duo: Tech Directors and Tech Coaches Partnering to Succeed"
"Eureka! The Camp-Course Combo for 9th Graders"
"#OneStoryForward: Using Clips to Build Community One Story at a Time"
Session 3 of the Ed Tech Coaches Playground on Tuesday June 27 (12 to 1 pm). Click below for materials from presentations by Alyssa Tormala and Ellie Gilbert. Click below for presentation slides for "Power of Infographics", "Celebrating Discomfort" and "PD in 21st Century" by Alyssa Tormala. If the Scribd visuals do not work, please click on the file links above them. 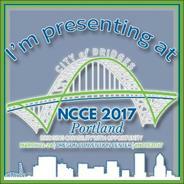 Ellie's Ignite Speech at NCCE 2016: "Why I would never, ever want to teach without iPads again."